The Climate Silly Season is still going full blast! 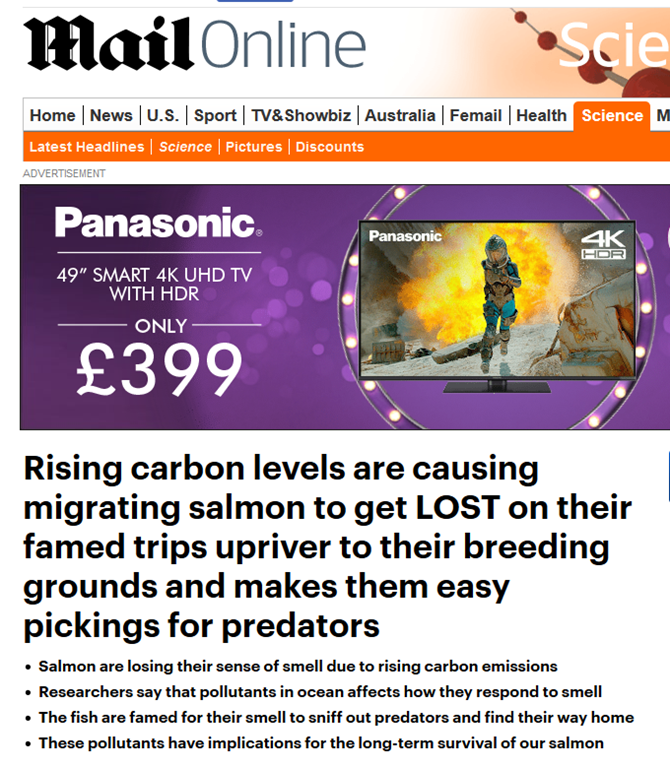 Salmon are losing their powerful sense of smell because of carbon dioxide being absorbed by the ocean, according to new research. When carbon dioxide in the air is soaked up by a body of water it breaks apart and makes the ocean more acidic. Scientists found that this increased acidity has a significant affect on how salmon process smells and is causing them to get lost on their trips back to their breeding grounds and making them easy prey for predators. After exposing the fish to higher levels of CO2, they saw that they were able to smell the odours but their brain did not know how to process them. While there are generous grants available to research junk science like this, we will continue to be bombarded by this nonsense. The whole idea that we somehow have a perfect, goldilocks type climate is transparently absurd. Salmon have been around for millions of years, during which time CO2 levels have gone up and down, without any obvious impact on salmon. While the two things do not necessarily correlate, commercial capture of wild salmon has been steadily rising at the same time as CO2 levels have been increasing. The idea that the world’s oceans have a constant PH is in any event a myth. It can vary considerably from one part of the world to another. Not only that, PH levels can fluctuate in specific locations. Off the coast of Washington, where this new study was based, PH can vary from under 8 to 8.5 . These are not seasonal variations, as the measurements are now only taken during a two week window in May/June each year. Somehow the fish seem to avoid losing their bearings or getting eaten when PH drops. What always strikes me about these sort of studies is the assumption that nature is incapable of adapting. Maybe the salmon in this test did get a bit confused when dumped in lower alkali water. But is it not likely that they, or their offspring, will quickly adapt to changes? Particularly when such small changes are spread over many decades.